Home | John Deere rotary wins Mower of the Year award. John Deere’s 1500 Series TerrainCut front rotary mower has won the Horticulture Week What Kit? Ride-On Mower of the Year Award 2015, announced in December. The mower was selected from a shortlist of eight machines that also included the John Deere X590 Multi-Terrain lawn tractor and ZTrak Z997R zero-turn mower. Celebrating the very best in professional machinery, the WhatKit? Mower of the Year Awards 2015 were split into three separate categories – pedestrian, ride-on and tractor-mounted/towed. The ride-on award citation said: “This has been the hardest category to judge. There are several worthy winners and we met on three occasions to try to decide the winner. In the end it was the versatility of the John Deere mower that clinched it. Originally launched at IOG SALTEX 2014, there are five 1500 Series TerrainCut models equipped with powerful, high-torque, three-cylinder diesel engines from 24 to 36hp, four-wheel drive, high-capacity rotary mower decks and a new optional grass and leaf collection system. They are designed to mow and collect thick grass at high speeds and still produce a quality cut. Featuring a compact design for manoeuvrability and easy transport and a robust hydrostatic transmission, the range meets the various needs of landscapers, contractors, groundsmen, greenkeepers, local authorities and other amenity turf customers. There is a choice of durable 7-Iron 1.5 and 1.8m (60 and 72in) side- and rear-discharge decks, with an optional mulching kit, and a John Deere factory fitted cab is available as standard on two models. Key user-friendly features include cruise control, a comfortable seat, Twin Touch pedals for the transmission and an electro-hydraulic deck drive clutch, while an air ride seat is optionally available. The quick-attach GLC1500 grass and leaf collection system has a hopper capacity of 600 or 900 litres. The collector’s fast dump speed, 203cm (80in) high tip and 83cm (33in) long reach features also increase overall productivity. 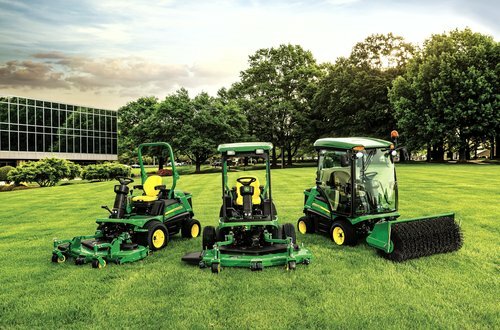 Additional attachments such as a front-mounted brush or blade allow the mowers to be used year round for a wide range of other commercial applications, including both leaf and snow clearance.